Tag Archive | "sovereign debt"
As Odysseus was returning home from the Trojan War, he came to a narrow channel that enclosed two deadly monsters: Scylla and Charybdis. On one side – Scylla – a six-headed demon that devoured any sailors that came too close. On the other side – Charybdis – a kraken that would swallow massive amounts of water to create huge whirlpools that capsized any ship in the area. While these whirlpools would only come three times a day, a sailor had no way of predicting when one was about to begin. Avoiding Charybdis meant passing through Scylla’s striking zone, and vice versa. Odysseus had to make a difficult decision. While he originally contemplated charting a course down the middle of the channel, in the end he decided it was better to pass within the reach of Scylla. With Scylla he would only lose six sailors, one to each of her six terrible heads, rather than risk the loss of his entire ship in the whirlpool. Today, the European Union faces a similar situation as it contemplates the Greek debt crisis. Scylla is reincarnated as a structured or “orderly” default program. A structured default would result in large losses for Greek debt-holders, but offers more predictability. Charybdis takes the form of continuing credit injections. While bailout money may allow Greece to escape the whirlpool of bankrupcy, many feel that there is a strong chance the country would default anyway. A default in this situation could lead to a panicked run on the banks and could potentially sink the entire European Union as the crisis spread to Italy and even Spain. Like the story of Odysseus’ trip home to Ithaca, the story of the Greek debt crisis has been a protracted one. Greece first requested a €45 billion bailout from the EU/IMF in April 2010, amid fears that it was carrying an excessive debt load. In May 2010, the EU/IMF agreed to a larger, €110 billion euro loan package to be distributed over three years. Of course, as a condition precedent to receiving this loan, Greece had to undertake rigorous fiscal adjustment (a.k.a. austerity measures). 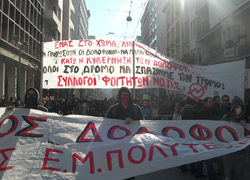 These austerity measures, which included public-sector pay cuts, pension reductions, and increases in taxes, lead to mass protests by the Greek population. Despite these austerity measures, however, Greece failed to bring its debt under control. In fact, 2010 estimates indicated that Greece’s debt had increased to €328 billion which amounted to 160% of its GDP. In June 2011, Standard and Poor’s downgraded Greece to a CCC credit rating, suggesting that the market felt that the bailout was a failure. As the situation continued to simmer, many analysts began to argue that an uncontrolled full default was looming. While it is difficult to predict what would happen in the case of a full Greek default, it would likely prove disastrous for the Eurozone. Banks in countries with weak finances could face a run by depositors, exposing Italy, and possibly even Spain, to the crisis. The Italian and Spanish economies are far bigger than those of Greece, and the European Union would struggle to bail them out if that became necessary. Thus, world leaders are moving towards rescue proposals that include a structured partial default for Greece. If these proposals are passed, the country will simply be allowed to pay back less than it actually borrowed. Institutions that lent money to Greece will have to write off some of the money they are owed. Like Odysseus, the European Union seems to be choosing to make a controlled sacrifice to avoid potential disaster. While structured default includes guaranteed losses, those losses are easier to contain. Let’s hope that the European banks are able to come out relatively intact as they pass through Scylla’s many-headed attack.